There are times when music lovers can just feel a talent coming into his or her own, when that artist is someone to catch onstage or on record at every opportunity. Drummer-composer Devin Gray has arrived at such a moment. 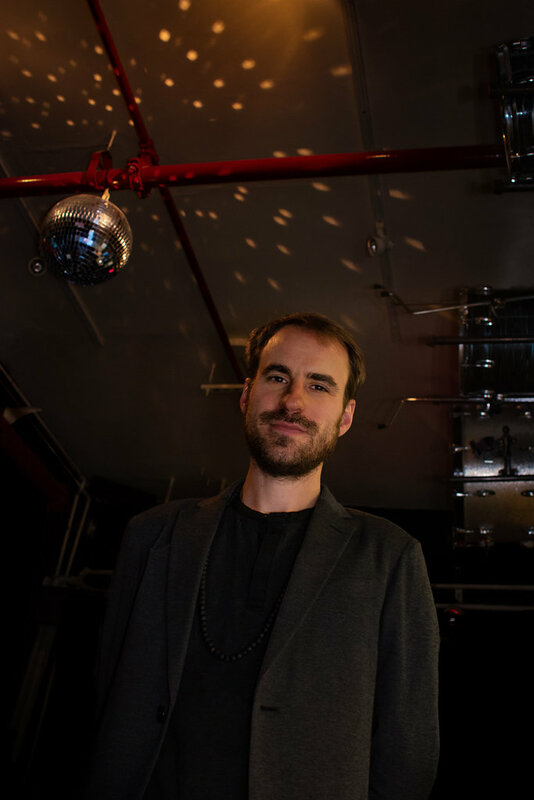 The Brooklyn-based artist made his leader debut in 2012 with the Skirl Records release Dirigo Rataplan, which featured him fronting the eponymous band with tenor saxophonist Ellery Eskelin, bassist Michael Formanek and trumpeter Dave Ballou, each a master improviser renowned far and wide among fans of creative music. 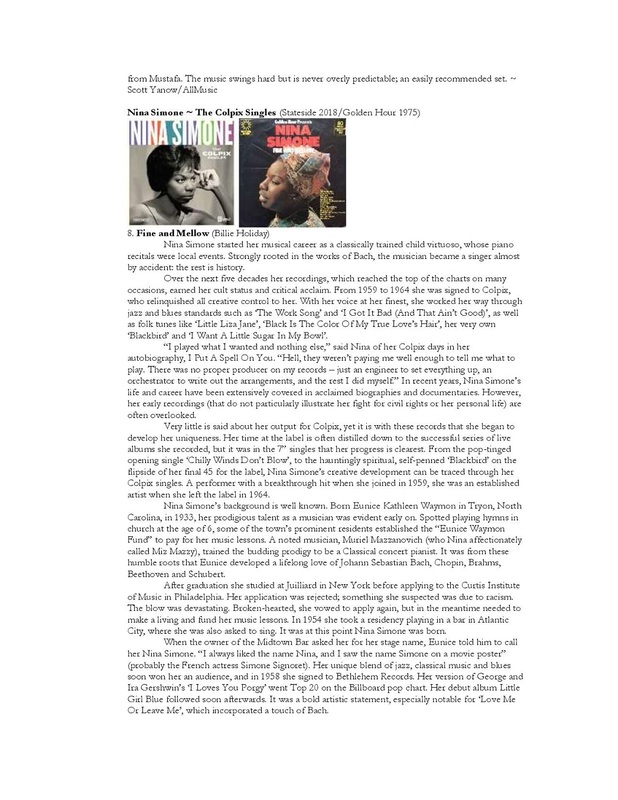 Cadence magazine declared that initial disc to be "fantastic," while JazzTimes said that Gray's debut represented "the work of a young artist who knows who he is." Now, after six years of intensive experience as a leader and sideman on both sides of the Atlantic, Gray has reconvened this all-star group for Dirigo Rataplan II, which will be released on CD, vinyl, digitally and for streaming via Rataplan Records on Sept. 21, 2018. 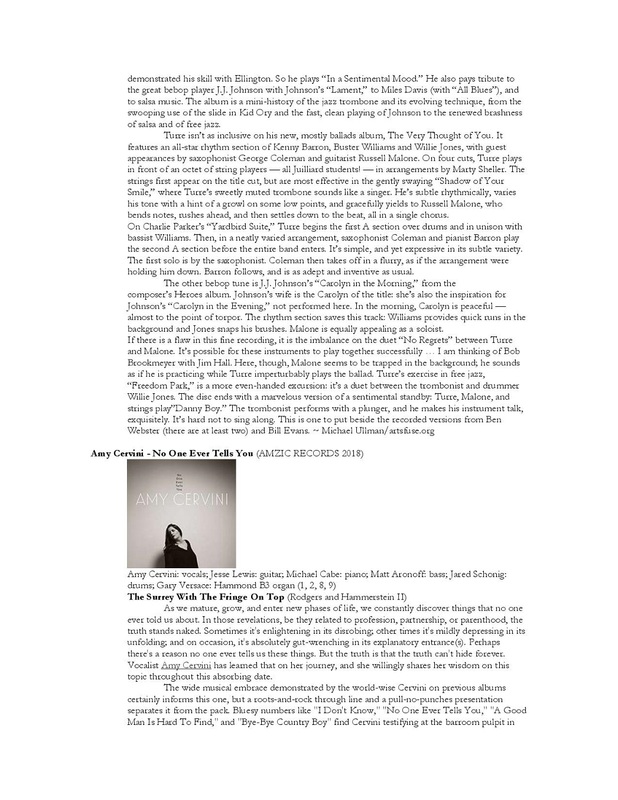 Time Out New York has praised Gray's compositions for balancing "formal elasticity with a meticulous sense of pacing." The new album brims with more earworm melody, richly implied harmony and a loose-limbed sense of rhythm as something physical and flowing - as blood, as breath. Fans of jazz from Ornette Coleman and Henry Threadgill to Dave Holland and Craig Taborn will dig this organic mix of composition and improvisation, structure and freedom, atmosphere and dynamism. 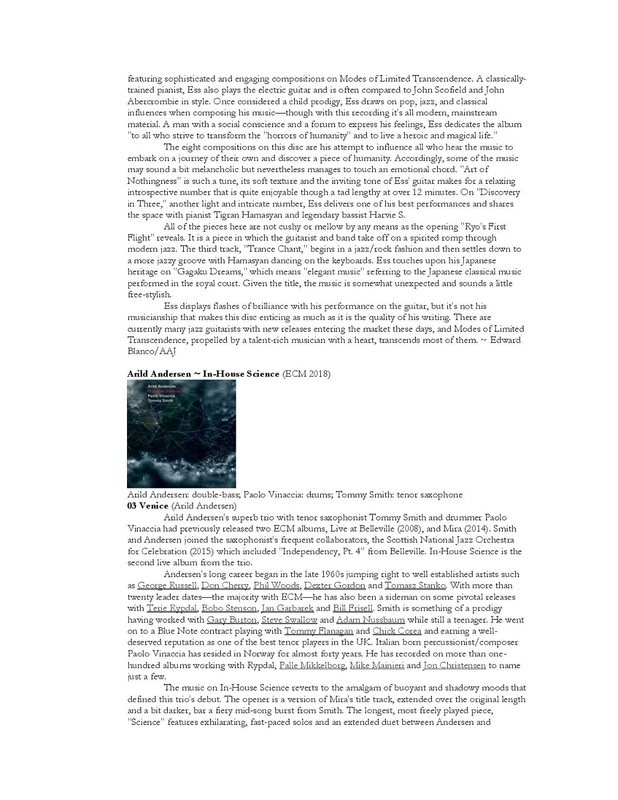 About the evolution of Dirigo Rataplan and his writing for the band, Gray says: "I've become more at ease with following my natural artistic impulses. 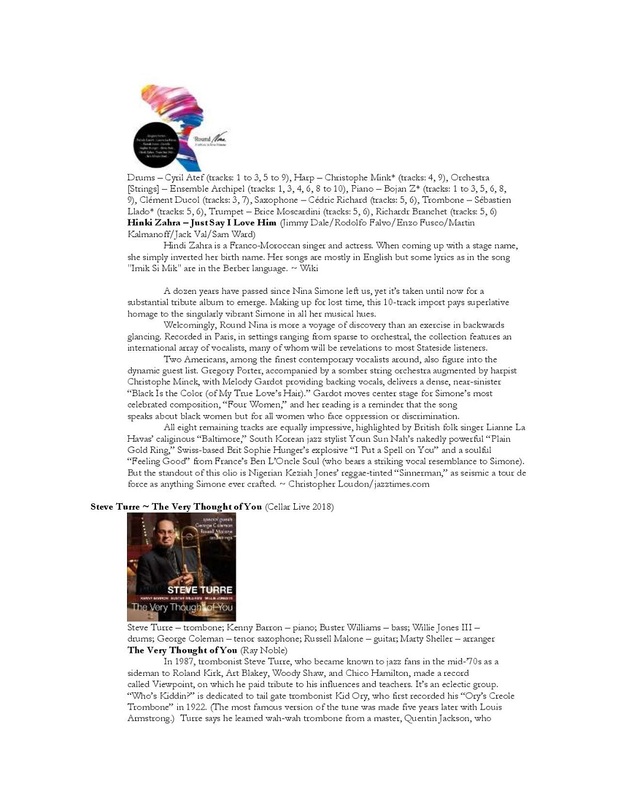 The experiences I've had over the past six years have been so inspiring - in the intense, ultra-energized New York jazz scene, of course, but also in Europe, where players in improvised music are so open to different genres and have this holistic approach to art and creativity. 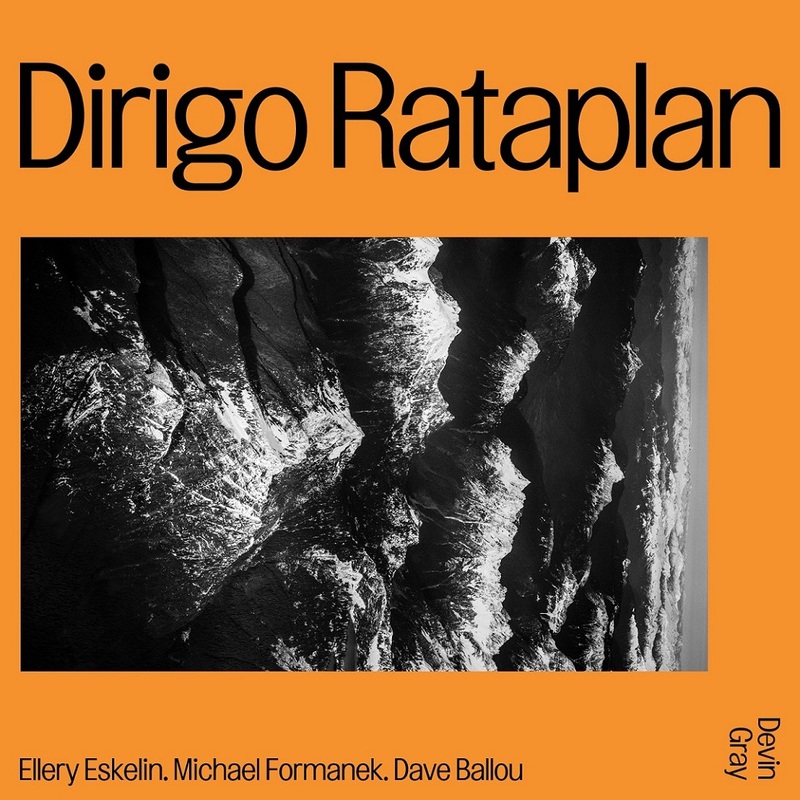 With Dirigo Rataplan II, there is more free improvisation in the music, but I also think the melodic fluidity between the composition and the improvisation is more seamless, with one flowing into the other in a way that I really like. 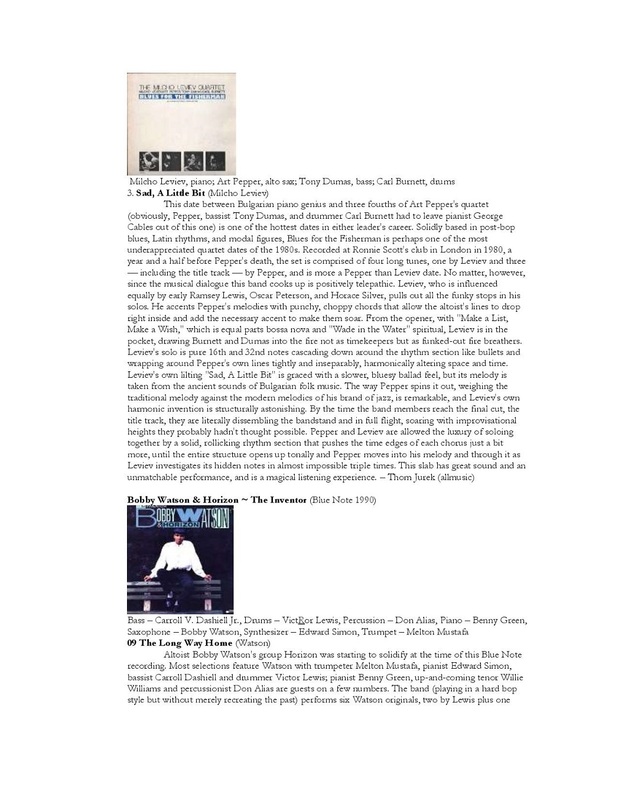 This music is personal for me, but I want Mike, Ellery and Dave to do what it is they do, to maximize the pieces in the way that I know they can." 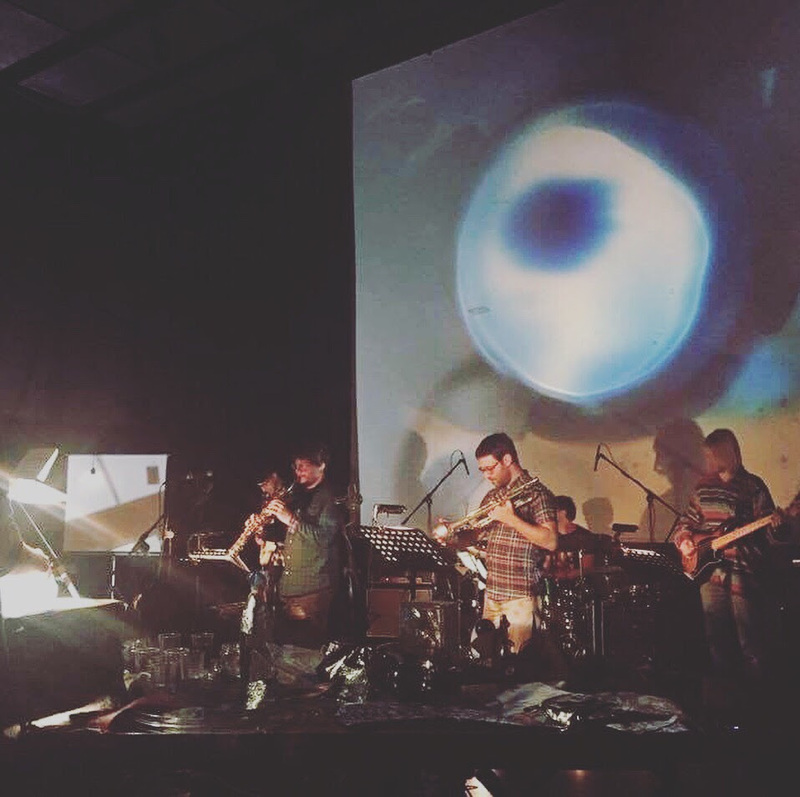 About working with Gray, Formanek says: "Devin has grown as a composer since that first quartet recording session in 2011, but most important, he has a much more evolved sense of who he is_ as a musician, and also of who we are in the band as improvisers. These instincts take time to develop, and it has been great to see that process unfold in both his playing and his composing. 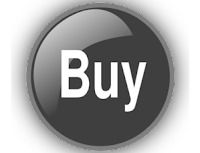 This music is free and open with a lot of room for improvisation, but the tunes also have an intrinsic rhythmic and melodic character to them, a color and energy. With the quartet having played together more now, the sessions for the new album felt even better." 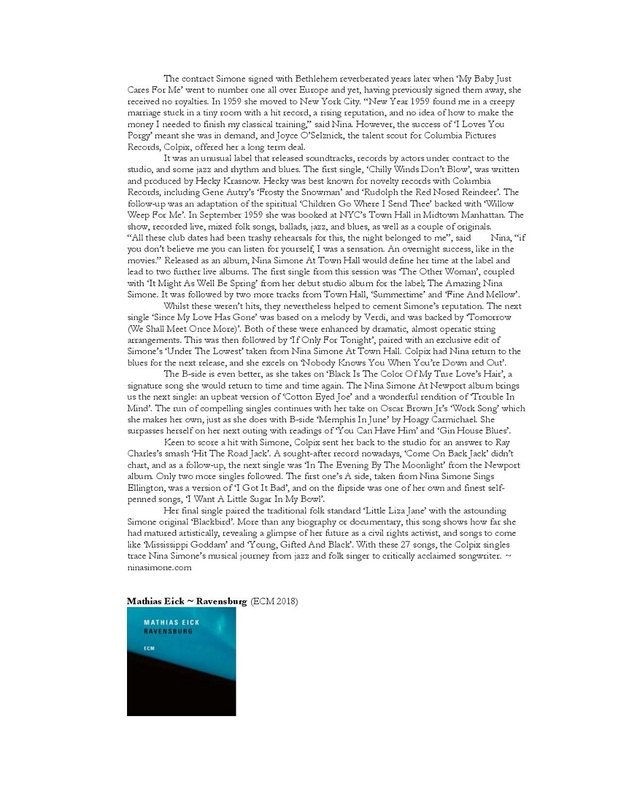 For Gray, what is most vital about Formanek "is not just that his tone and sense of time are so incredible. It's also that he cares so much about doing whatever he can to ensure the quality of the music in front of him. He's a composer's improviser, in that way. I feel this total, unspoken trust with him." About Eskelin, Gray says: "Ellery sets the bar so high for improvisation. 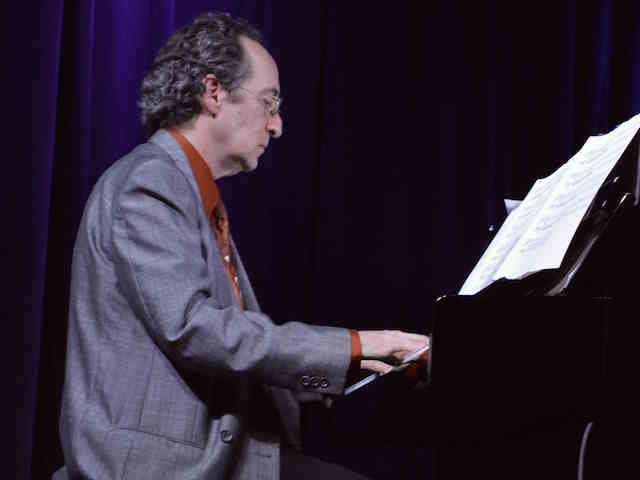 The fluidity of his solos, the intense forward motion - that's what New York musicians have more than anyone else." Regarding Ballou, the drummer adds: "I've known Dave's playing intimately since I was a kid. I don't think he has ever sounded better, with that beautiful tone and wide palette of expression. He brings a strong interpretive sense to my music in that he anticipates what I'm looking for, yet via his own sensibility. Working with cats like this, you don't have to worry about individualism - it's in everything they do. They bring what are just notes on a page to real life." 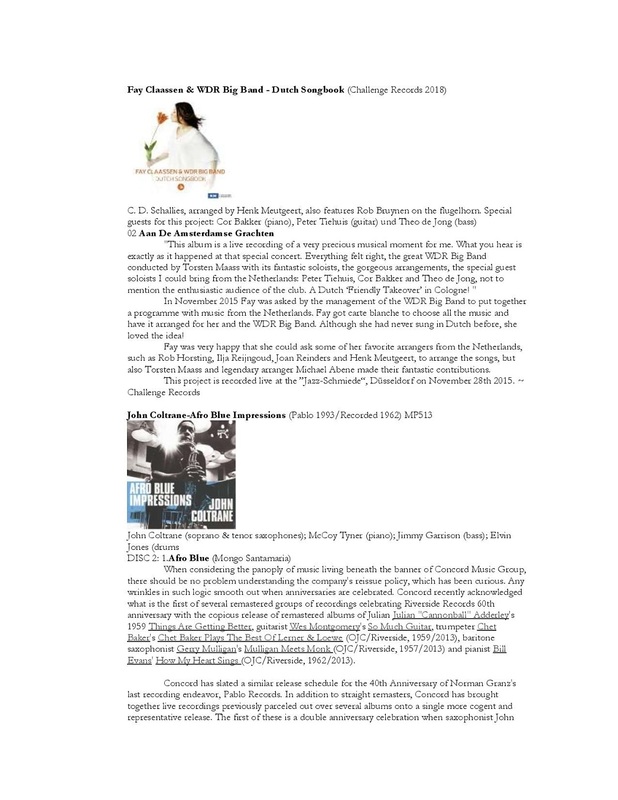 Reflecting further on Dirigo Rataplan II, Gray concludes: "I don't set out to make jazz records, per se. I set out to make music, period - to capture the moment, the contemporary feel of the music, hoping that it can reflect in some small way how we live now and what we all have to deal with as human beings in the world." In addition to Dirigo Rataplan, Devin Gray leads the quartet Relative Resonance, featuring Chris Speed, Kris Davis and Chris Tordini. 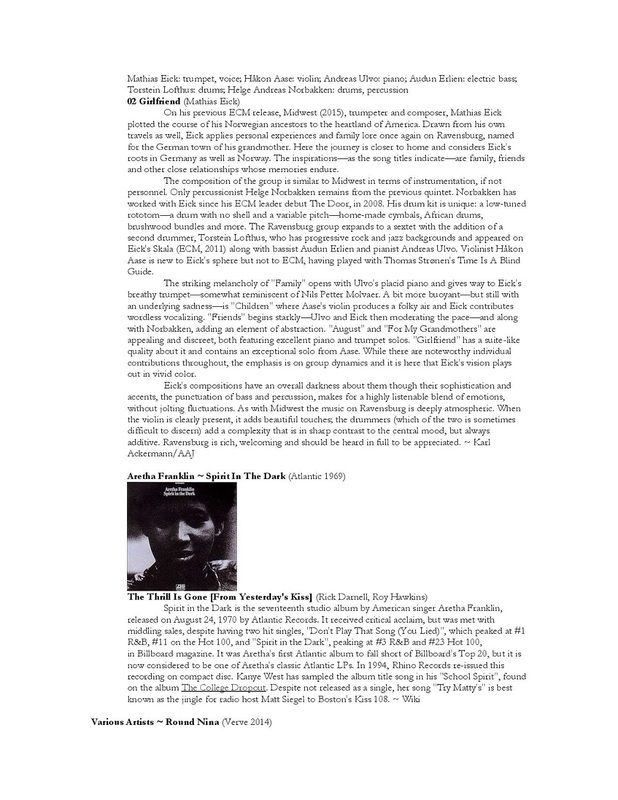 Reviewing that band's eponymous Skirl Records album, All About Jazz said: "The vitality of Relative Resonance can't be deniedŠ the music here literally sparkles with wit and resourcefulness." 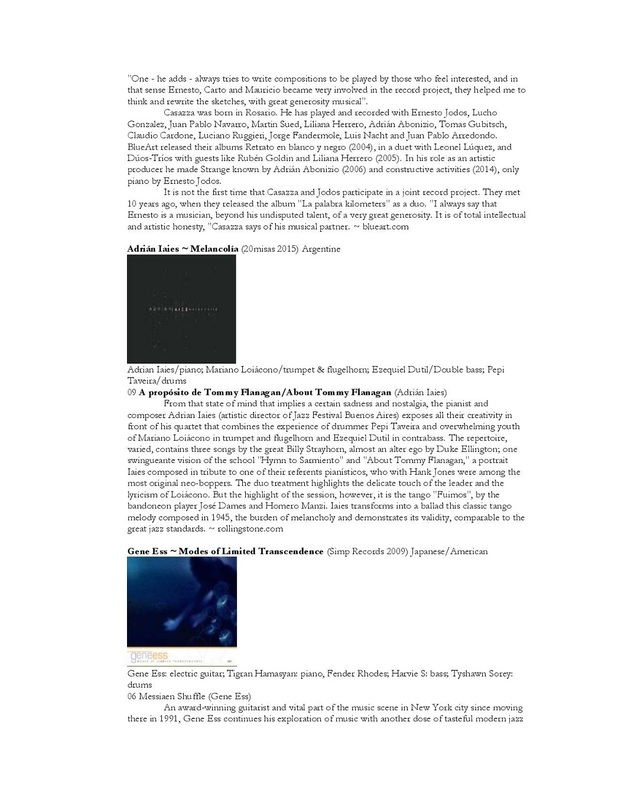 On record, Gray has also led his Cloudsounds trio (with Ingrid Laubrock and Corey Smythe) and his quartet Fashionable Pop Music (with Tordini, Jonathan Goldberger and Ryan Ferreira). 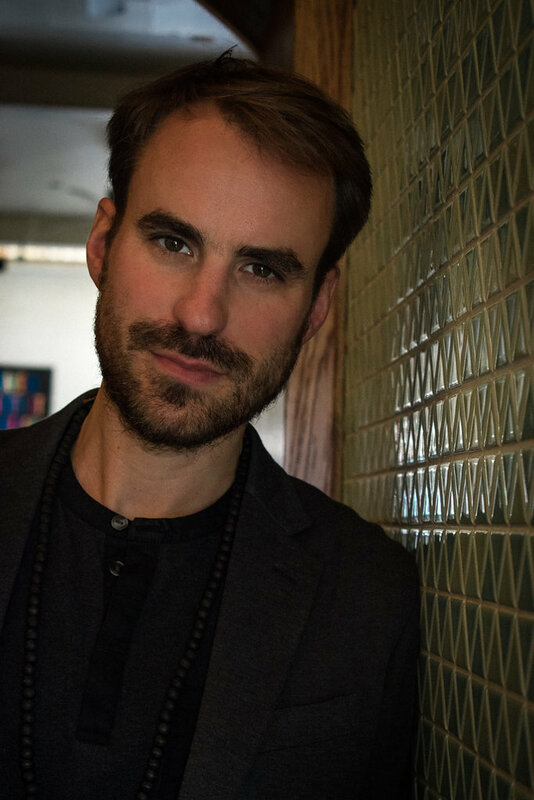 He recently released a hard-grooving digital single fronting his quartet Meta Cache with Jeremy Viner, Elias Stemeseder and Kim Cass. 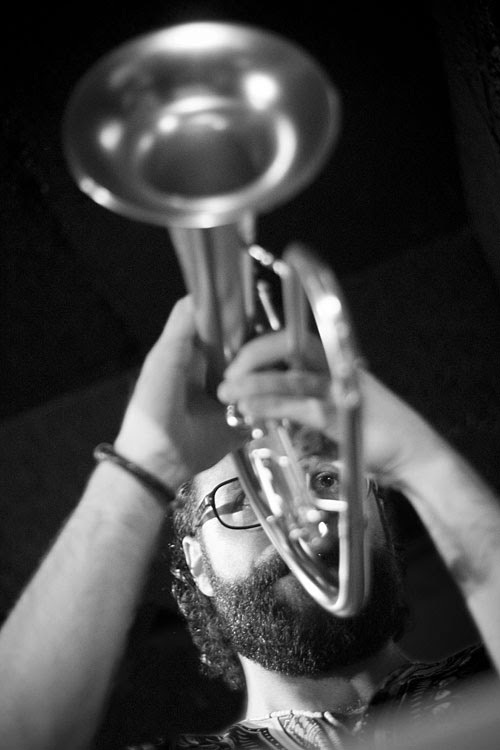 As a sideman, Gray has recorded recent albums as part of Nate Wooley's Argonautica sextet, trumpeter Daniel Levine's trio Knuckleball (with Marc Hannaford) and a trio led by pianist Santiago Leibson (with Drew Gress). 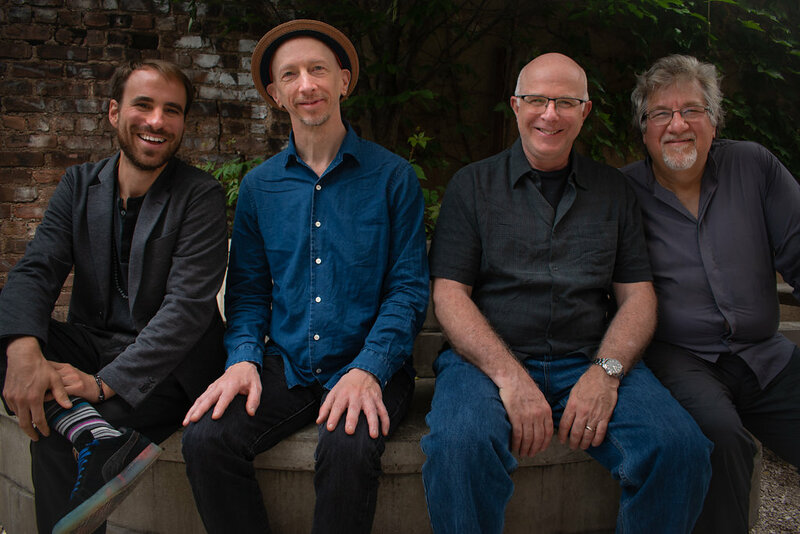 Of late, the drummer has played with Dave Liebman and Tony Malaby, along with touring Europe at the head of a trio with Speed and Gress. 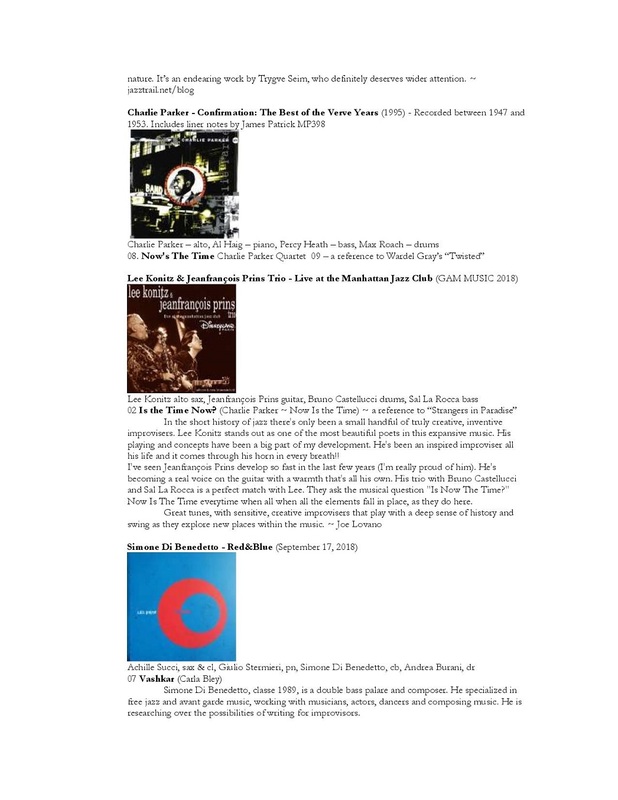 Gray's recent collaborators also include Gerald Cleaver, Uri Caine, Andrea Parkins, Satoko Fuji, Richard Bonnet, Daniel Guggenheim, Marc Ducret, Frank Gratkowski, Jacob Anderskov, Eve Risser and Susana Santos Silva. 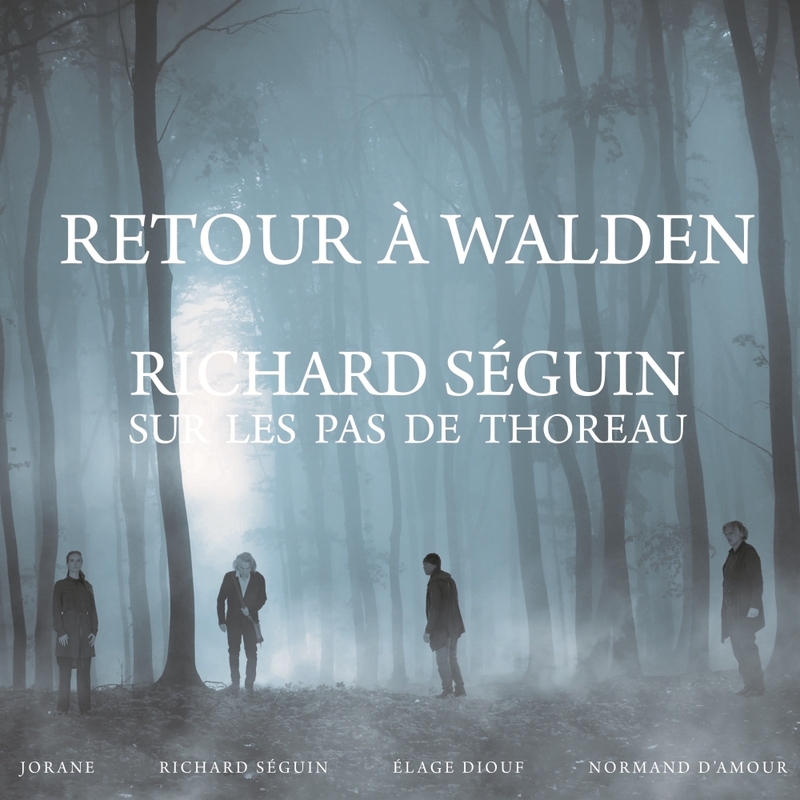 L'action des chansons de l’album se déroule entre 1845 et 1847, période où Thoreau s'est retiré dans les bois tout près de l'étang de Walden. Vous rencontrerez Henry David Thoreau, John Brown, leadeur du mouvement abolitionniste; Lidian Emerson, amie et confidente de Thoreau; et enfin William, personnifiant l’Africain mis en esclavage, en fuite vers le Canada. Des collaborateurs de renom ont accepté l’invitation de Richard. À l’interprétation des personnages, outre Richard Séguin, vous retrouverez Jorane, Élage Diouf et Normand D'Amour. Normand Baillargeon signe un texte sur la pièce Guerre et tempête, créant ainsi le lien entre hier et aujourd’hui. Enfin, Hugo Perreault et Guido Del Fabbro signent les arrangements et la réalisation. Créé à La Nouvelle-Orléans, NOLA French Connection Brass Band s'est directement inspiré des légendaires brass band locaux. NOLA, contraction de New Orleans Louisiana, s'est donné le défi de jouer et transmettre le plus fidèlement possible la musique des second lines néo-orléanaises. Mêlant hip-hop, funk et jazz, le brass band combine les rythmes entraînants des percussions aux puissants riffs des cuivres, avec une énergie contagieuse. 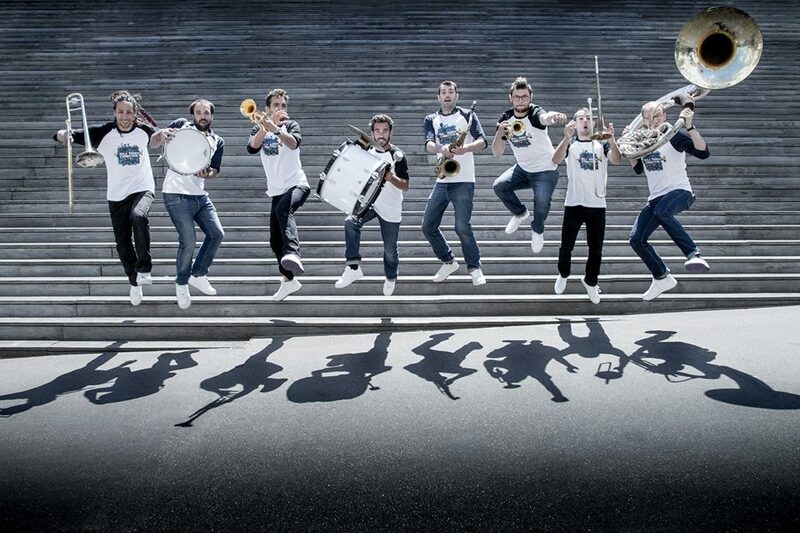 Le 21 septembre, le NOLA French Connection Brass Band est de retour avec son second album à l'énergie incroyable et au groove très entraînant. Grâce à la puissance de sa section cuivre et à une rythmique sans faille, l'auditeur se retrouve vite entrainé dans la multitude des influences qui fait l'originalité de leur musique où l'on retrouve des clins d'oeil à Bootsy Coolins, Parliament, George Clinton ou Maceo Parker. 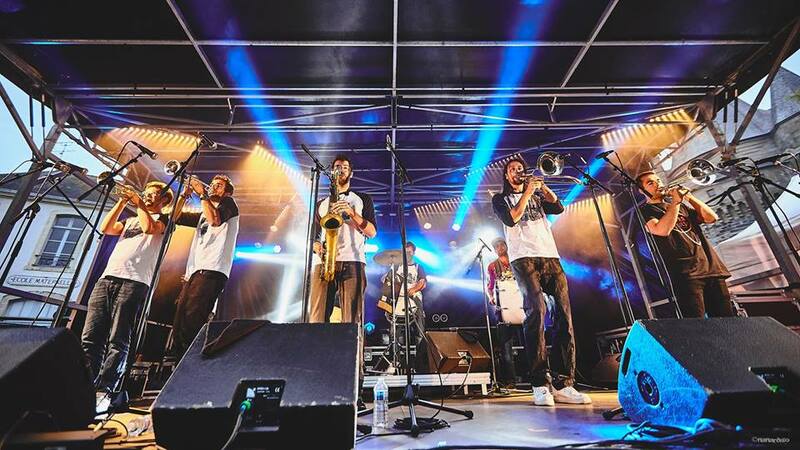 Mêlant hip-hop, soul, funk et jazz, les neuf musiciens du NOLA Brass Band proposent un jeu d'ensemble très énergique qui prend toute sa dimension dans ses performances live. On pourra les retrouver les 15 et 16 octobre en concert à la Boule Noire pour la sortie de l'album, puis en tournée dans toute la France. NOLA French Connection, créé en Nouvelle-Orléans en novembre 2016, est un groupe de 9 musiciens parisiens. NOLA s’inspire directement des brass band locaux et fait un premier passage remarqué dans l'émission de Dan Meyer sur la radio Louisianaise WWOZ. Mêlant hip-hop, funk et jazz, le groupe se focalise sur le jeu d'ensemble, ce qui lui permet de déployer une énergie « puissante » en live. Partis effectuer une sorte de pèlerinage initiatique où les brass band sont rois, les musiciens fondateurs de NOLA ont pu boire à la source la musique qu’ils aimaient. 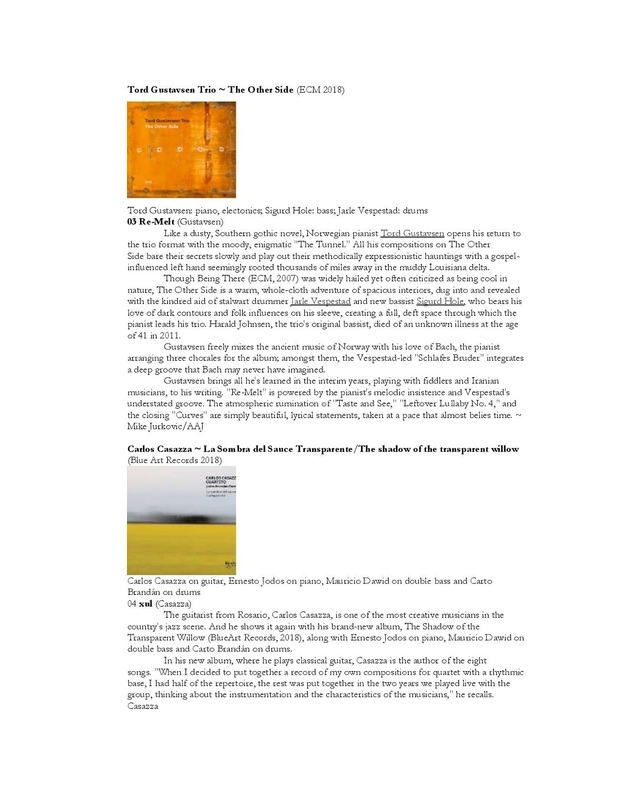 Tremper leurs instruments dans ce creuset culturel, s’imprégner des conventions musicales de ces formations issues des quartiers de La Nouvelle-Orléans et oser jouer avec les musiciens locaux, voilà le résumé de ce que fût ce premier passage sur les terres de leurs idoles. S’ils connaissaient les grands papas de cette musique (Dirty Dozen Brass band, Rebirth Brass Band, Hot8, etc…) il leur fallait pouvoir sentir la pulsation de cette musique. 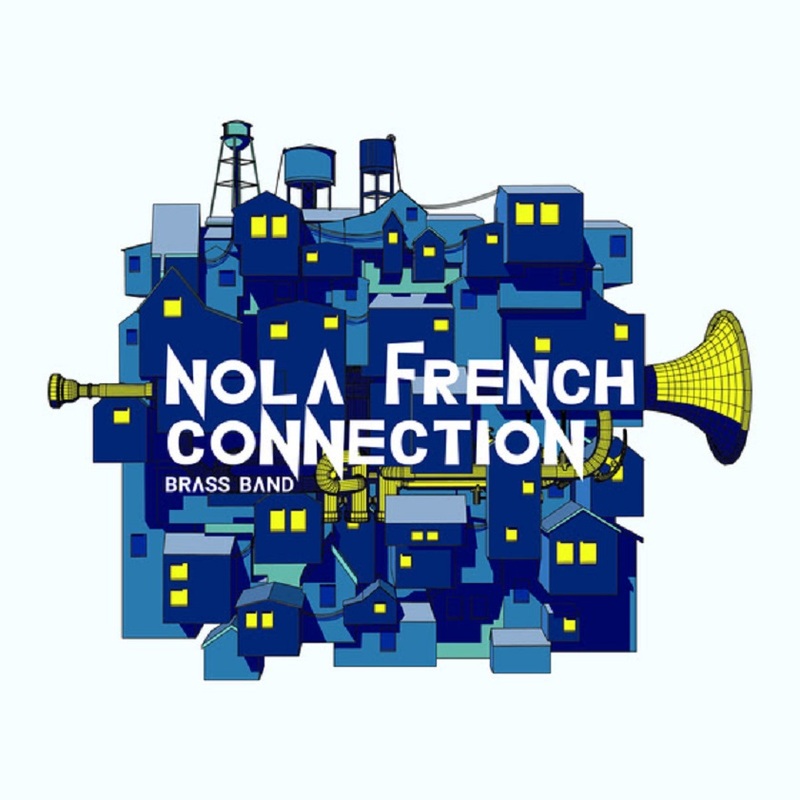 À leur retour , la décision était prise pour que ce passage en Louisiane ne soit pas simplement une découverte mais une mise en appétit pour lancer un projet : NOLA (New Orleans Louisiana) French Connection Brass Band était né. Les compositions s’articulent autour de questions/réponses entre les 9 instrumentistes de Nola et dans lesquelles s’intercalent des chorus d’instruments ou des riffs de cuivres où les clins d’oeil aux maîtres Bootsy Coolins, George Clinton ou Maceo Parker sont nombreux ! Le Nola French Connection sera en concert le 20 septembre à Vitry-le-François (L’Orange Bleue), le 29 septembre à Paris (Disney Love Jazz), le 12 octobre lors du Nancy Jazz Pulsations à Nancy, le 15 & 16 octobre à Paris (La Boule Noire) et le 18 octobre à Tourcoing lors du Tourcoing Jazz Festival. 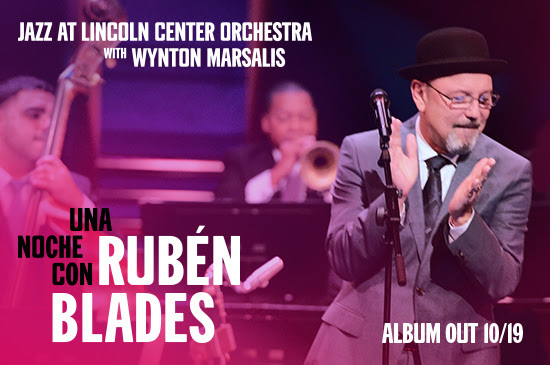 Rubén Blades joins the JLCO for a style-straddling album of salsa and swing! Coming Soon: Una Noche con Rubén Blades! 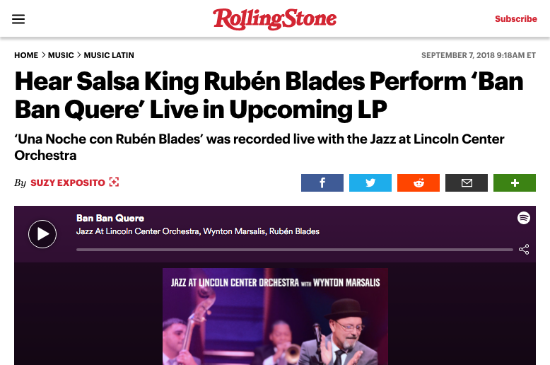 Blue Engine Records is proud to announce our next release: Una Noche con Rubén Blades by the Jazz at Lincoln Center Orchestra with Wynton Marsalis featuring Rubén Blades. 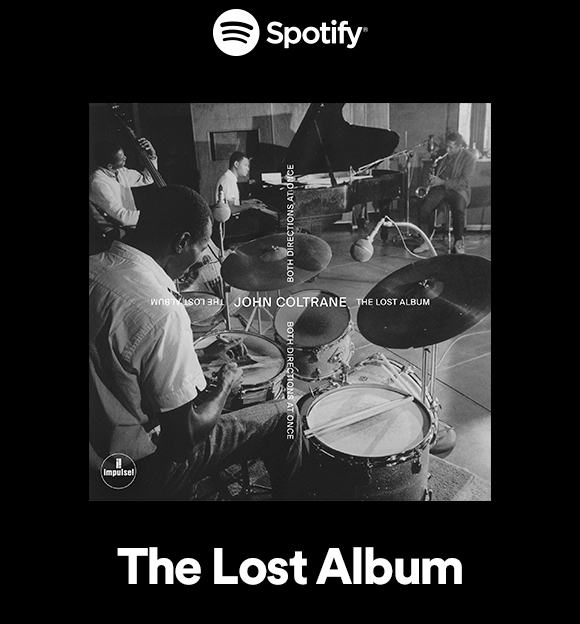 This record captures a historic 2014 meeting of New York's house band and the nine-time GRAMMY winning singer, songwriter, actor, and activist. For one very special night—music-directed by the JLCO's bassist and "emerging master in the Latin jazz idiom" (DownBeat) Carlos Henriquez—the worlds of salsa and swing collided. 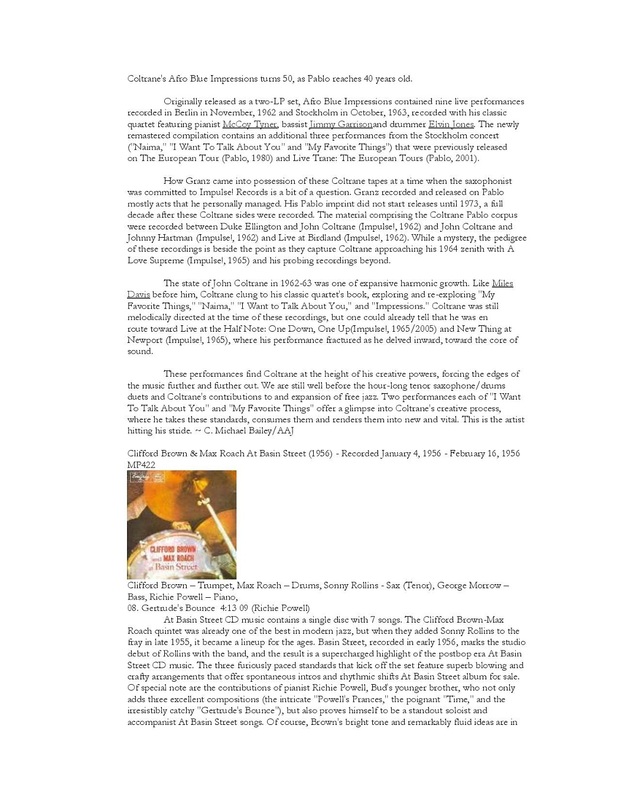 The result was a performance that the New York Times called "radically beautiful." Make sure you'll have Una Noche as soon as it's released on October 19th! Preorder it today from our webstore as a standalone CD featuring a limited-edition maraca. You'll also get a discount to our 2018–19 opening weekend concerts! Learn more about the album—and hear the first single, "Ban Ban Quere”—on RollingStone.com. The fiery salsa tune was composed by Calixto Varela Gomez and originally made famous by Ray Barretto's 1975 Fania Records release, Barretto. Nove giorni con 40 appuntamenti in gran parte gratuiti tra concerti, produzioni originali, performance, flash mob, atelier di creazione, workshop, incontri, master class ospitati in spazi pubblici, piazze e attrattori culturali di Ruvo di Puglia “città d’arte”. Un pubblico numeroso proveniente dalla Puglia, dal resto d'Italia con alcuni appassionati dall'estero. Un nutrito gruppo di giornalisti, addetti ai lavori e opinion leader che hanno seguito la manifestazione. Centinaia di musicisti e danzatori professionisti e non per un percorso artistico inedito che parte dalla banda, s'inoltra nella sperimentazione musicale e incrocia la danza contemporanea. 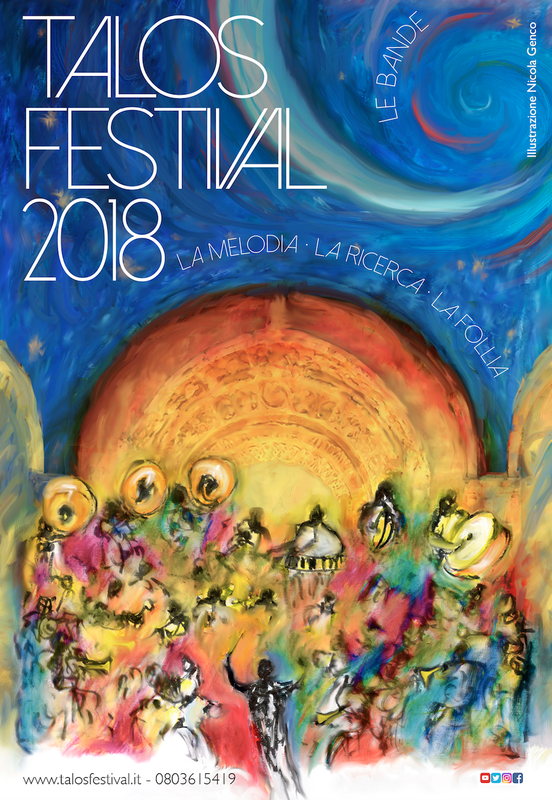 Diretto dal trombettista Pino Minafra e dal pianista Livio Minafra, con il progetto coreografico di Giulio De Leo della Compagnia Menhir, il Talos Festival di Ruvo di Puglia - che si è tenuto dal 1 al 9 settembre - si afferma sempre più come uno dei festival più importanti della Puglia per qualità artistica e coinvolgimento della comunità. Non appena si sono spente le luci di questa importante edizione, l'Amministrazione comunale, che organizza il Festival con il sostegno della Regione Puglia, di altri partner pubblici e privati e di uno straordinario gruppo professionisti e di volontari e volontarie, ha lanciato le date dell'edizione 2019 che si terrà da sabato 31 agosto a domenica 8 settembre. "Il nostro Festival è una scommessa vinta di un Sud che si riscatta e finalmente vanta se stesso. Siamo sempre meno soli in un viaggio nella consapevolezza, sempre più partecipato ed inclusivo. 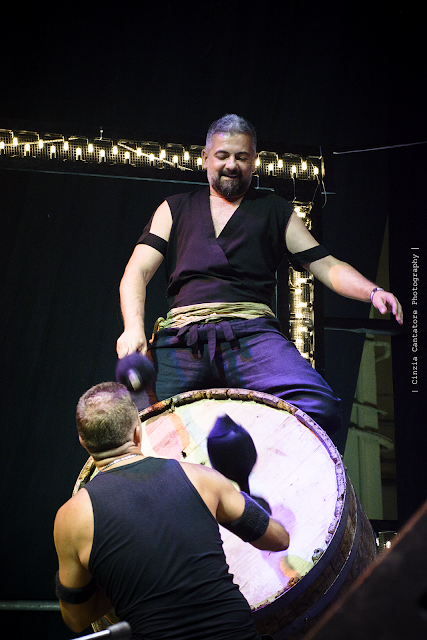 Persone, bambini, istituzioni, musicisti, colori, suoni, bande, danze, gesti, luoghi, storie e odori", sottolineano Pino e Livio Minafra. "Una zattera sempre più affollata e sempre più in grado di dare piccole-grandi risposte alle numerose domande del nostro assetato Sud. Una terra dove occorre coraggio per partire, coraggio per tornare e coraggio per restare. Una terra fieramente mediterranea e meticcia". 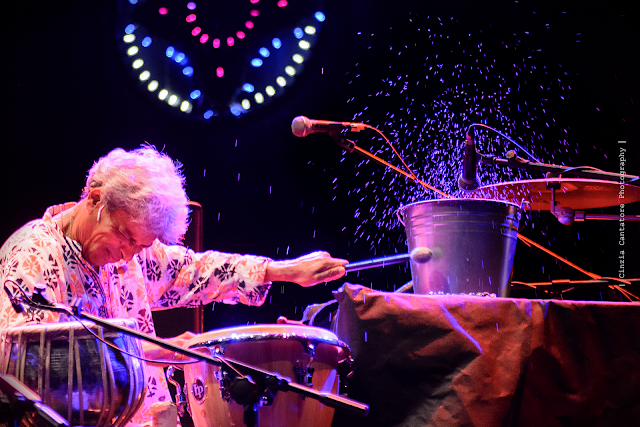 I concerti hanno proposto, infatti, una miscela di jazz, improvvisazione creativa e sonorità mediterranee con ospiti pugliesi, nazionali e internazionali come il Coro delle Voci Bulgare “Angelite”, il percussionista indiano Trilok Gurtu, il suonatore austriaco di vibrafono e marimba Roland Neffe, il pianista e la cantante greci Sakis Papadimitriou e Georgia Sylleo, il sassofonista e cantautore Enzo Avitabile con i Bottari di Portico, Vince Abbracciante con il suo progetto sincretico, la Bandadriatica nella sua versione "Ciclopica" e i Fratelli Mancuso. Completamente sold out anche la seconda edizione della Notte della Banda che ha visto per circa tre ore sul palco Pino Minafra & La Banda proporre un repertorio tradizionale e contemporaneo con la partecipazione di numerosi ospiti come il trombettista salentino Cesare Dell’Anna. Tra i protagonisti del festival il generoso tubista e serpentonista francese Michele Godard sul palco in numerosi progetti e curatore, con Michele Pisani, di una masterclass sulla musica d'insieme conclusasi con un concerto finale dei partecipanti. 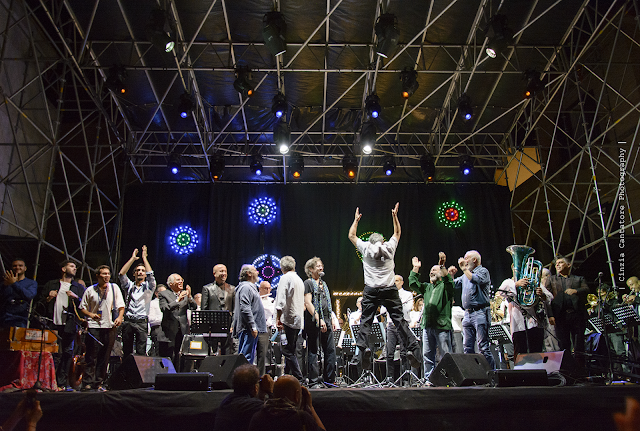 La prima parte del festival ha ospitato tante esperienze pugliesi in concerti gratuiti ai piedi della Cattedrale di Ruvo come l'Orchestra Musicaingioco, ispirata a "El Sistema de Abreu", il progetto Migranti con Luigi Morleo e l'Orchestra Sinfonica I.C.O. dell'Area Metropolitana di Bari, la Big Band del Conservatorio Piccinni di Bari, la Fanfara del Comando Scuole Aeronautica Militare di Bari e lo spettacolo Guarda che Banda!. 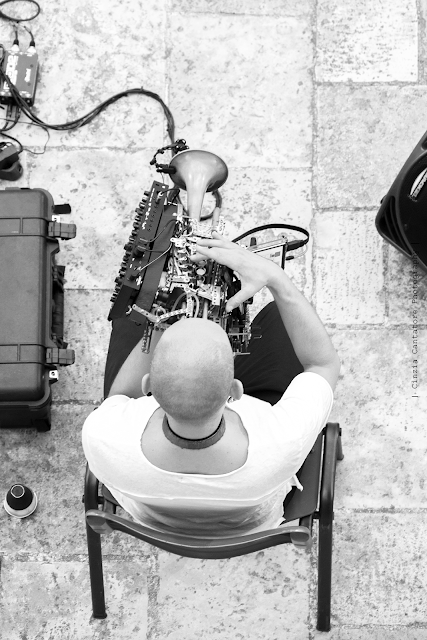 Ricco anche il programma dei concerti pomeridiani nella Pinacoteca d'arte contemporanea che ha accolto anche gli scatti del fotografo Raffaele Puce, la presentazione della storia del jazz in Puglia di Ugo Sbisà e un Convegno sul futuro della Banda con la partecipazione, tra gli altri, di Aldo Patruno (Direttore del Dipartimento turismo, economia della cultura e valorizzazione del territorio della Regione Puglia) che si è impegnato nell'avviare un lavoro di catalogazione e digitalizzazione delle fonti (spartiti, fotografie, programmi, articoli) e un censimento del mondo che si muove attorno alla Banda da giro, fenomeno tipicamente pugliese che ha affascinato artisti straordinari come Pietro Mascagni, Riccardo Muti, il premio Oscar Nicola Piovani, David Byrne e che porta da secoli le grandi arie dell'Opera in giro per le piazze. 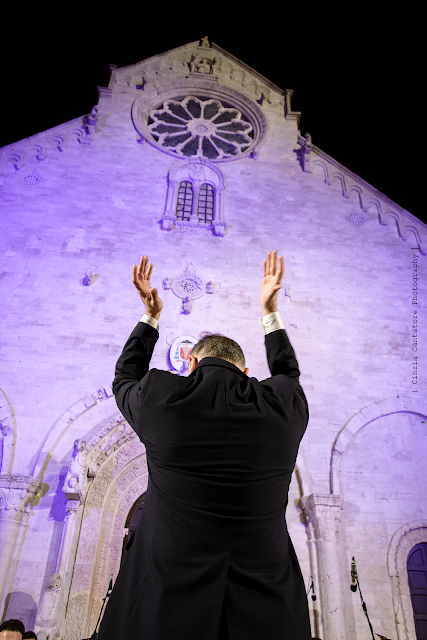 L'intento finale è quello di giungere a una legge o un provvedimento che possa regolamentare questo patrimonio. Se la ricerca musicale è stata sin dal 1993 la caratteristica peculiare del Talos, dopo l'esperimento della scorsa edizione, si è rafforzata quest'anno la contaminazione con la danza contemporanea grazie alla preziosa e innovativa collaborazione con il coreografo Giulio De Leo e con la Compagnia Menhir. "Un incredibile crocevia di linguaggi, esperienze artistiche, volti, suoni e vite. La nascita di una comunità aperta che nella cultura del gesto e della musica si riconosce e che nel Talos Festival ritrova in modo tangibile un bene comune. Identità, arte e bellezza", precisa De Leo. Donne e uomini di ogni età e origine (famiglie, diversamente abili, migranti, giovani, bambini) hanno danzato e incontrato le musiche e i musicisti del festival mettendo in scena quattro coreografie frutto di un lavoro durante alcuni mesi. In Arcipelago, Giardini Famigliari, Notturni e Passionale, attraverso la danza i cittadini si sono riappropriati del corpo come mezzo di espressione e soggettività e hanno vissuto lo spazio pubblico come luogo di comunità e di identità collettiva. 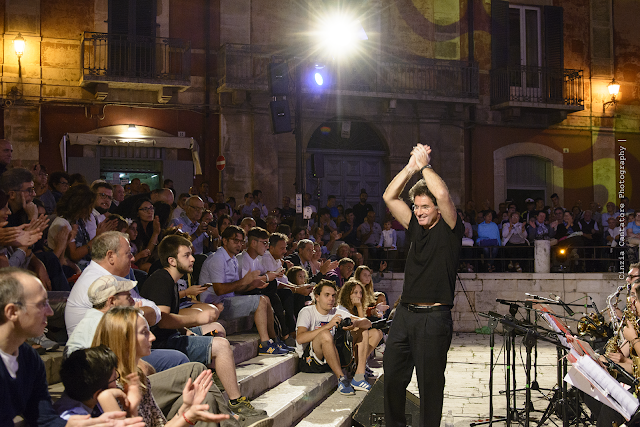 Il Festival ha ospitato inoltre il danzatore tedesco di origini brasiliane Rodolfo Piazza Pfitscher Da Silva, protagonista di “Genesi 2” con il Vincenzo Mazzone Percussion Ensemble, e la coreografa finlandese Sanna Myllylahti, docente dell’Università delle Arti di Helsinki, che ha tenuto un atelier di creazione coreografica per professionisti che si è concluso con la performance In The Middle con la musica del contrabbassista Giorgio Vendola. Talos Festival è organizzato dal Comune di Ruvo di Puglia in Ats pubblico/privata con associazione culturale Terra Gialla, compagnia di danza contemporanea Menhir, Conservatorio di Musica Niccolò Piccinni di Bari e Cooperativa Doc Servizi, finanziato dalla Regione Puglia nell’ambito dell’Avviso pubblico per lo Spettacolo e le Attività culturali FSC 2014-2020 – Patto per la Puglia, con il patrocinio e il sostegno di Camera di Commercio di Bari e Parco Nazionale dell’Alta Murgia in collaborazione con Confcommercio Ascom di Ruvo di Puglia, Orchestra Sinfonica della Città Metropolitana di Bari, Proloco di Ruvo di Puglia, Tipografia De Biase, Talos Viaggi, Hotel Pineta, Panificio Cascione, Arte e Musica Matera e con il supporto di Itel Telecomunicazioni, Supermercati Dok, Cagnetta ed Eurocoop. 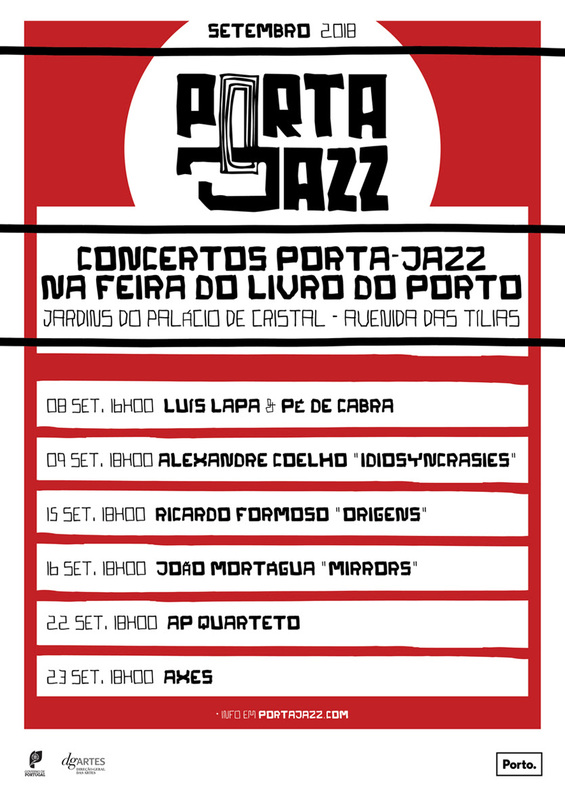 A Porta-Jazz continua a apresentar em parceria com a Porto Lazer, o Jazz do Porto com Carimbo da Porta-Jazz. Durante o mês de Setembro os concertos serão apresentados no âmbito da Feira do Livro. Concertos ao final da tarde de Sábados e Domingos, com entrada livre, na Avenida das Tílias do Palácio de Cristal. “Origens” reúne uma serie de composições originais que descrevem o percurso desde a minha chegada a Portugal. Este trabalho é o resultado da fusão do meu background musical e pessoal com as influências dos diversos projetos em que participei ao longo destes últimos anos, principalmente no circuito de Jazz da cidade do Porto. "Mirrors" é o projeto liderado por João Mortágua, resultante da residência Guimarães Jazz/Porta-Jazz 2016. 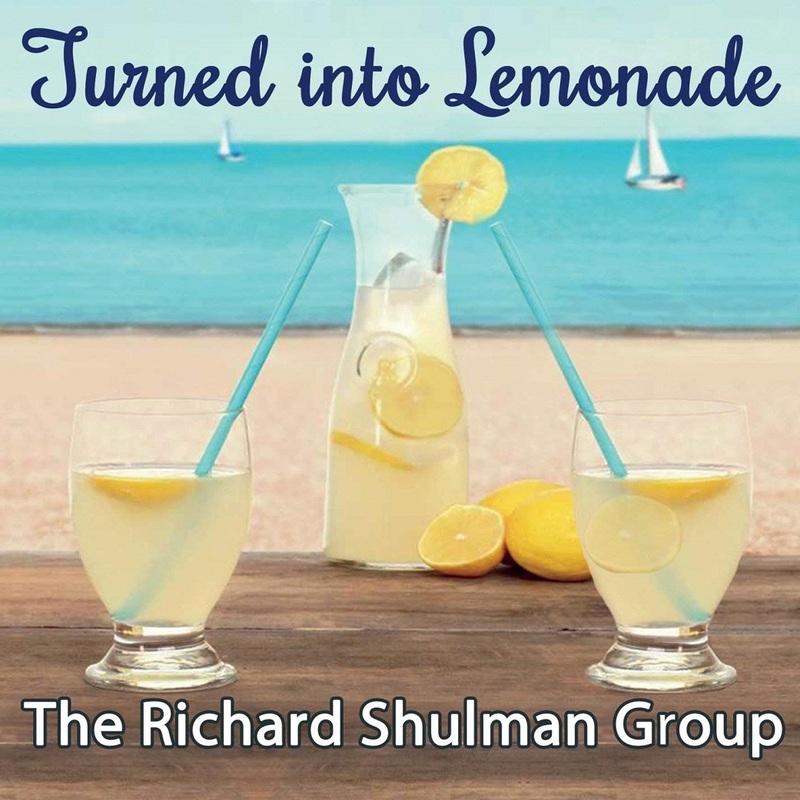 This is the fourth album of original music from The Richard Shulman Group and I’m honored to be working with such skilled and intuitive musicians. 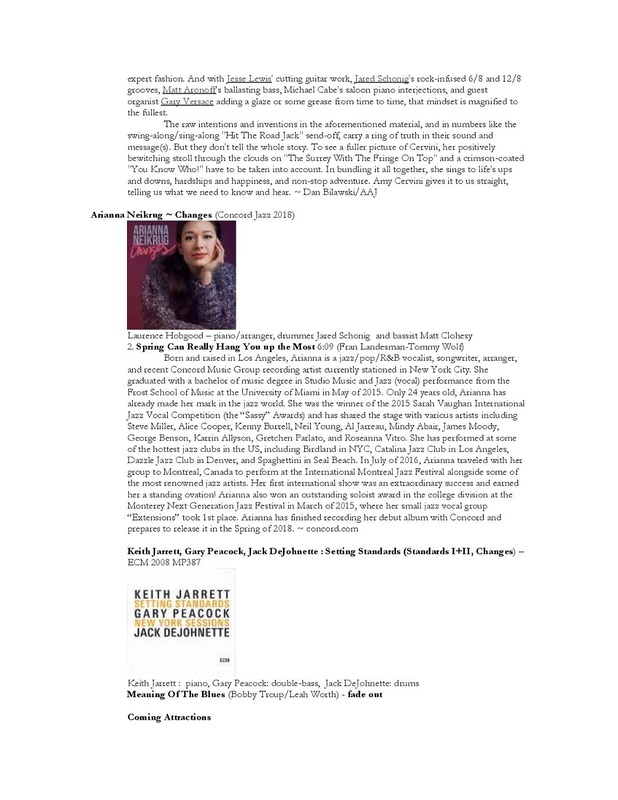 Turned into Lemonade is melodic, harmonically inventive jazz influenced by Pat Metheny, Lyle Mays, Keith Jarrett, Jan Garbarek, John Coltrane, Pharoah Sanders, Paul Winter, Oregon, Bill Evans, and Jay Beckenstein. 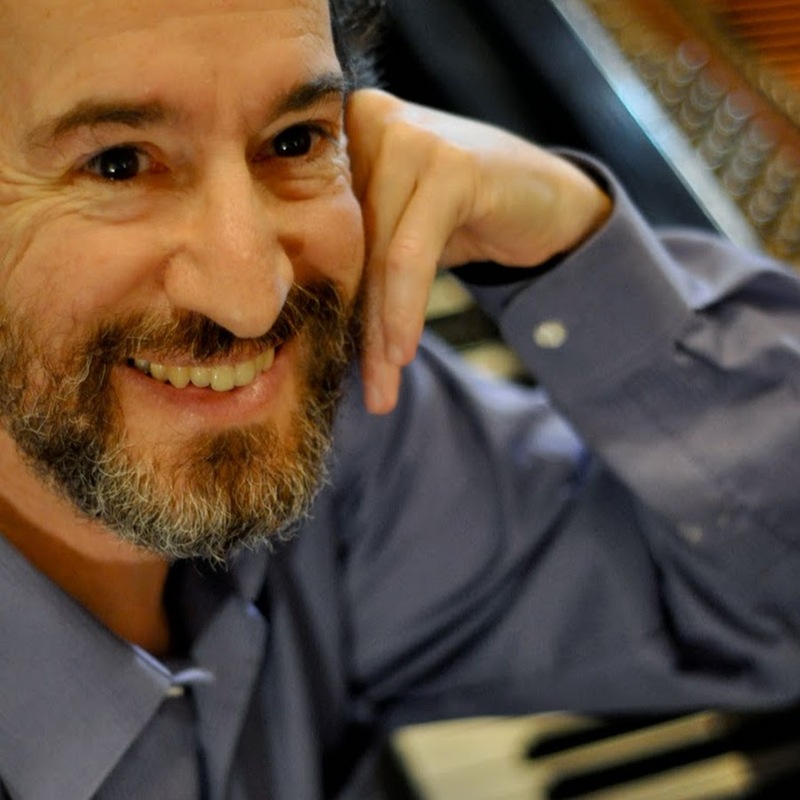 “Richard Shulman is a gifted pianist/composer with a distinctive goal: creating music that’s joyful to the ear and uplifting to the spirit. 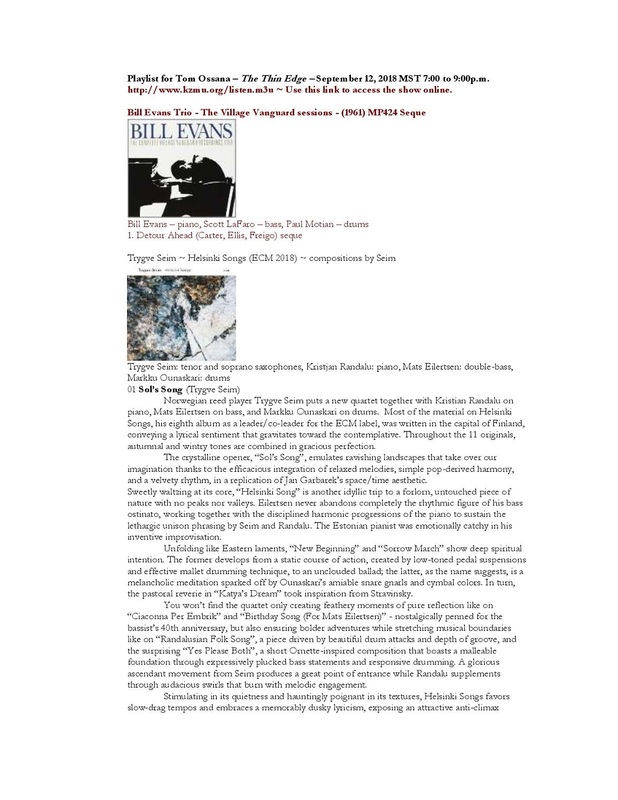 Bothsophisticated and accessible, his work has the harmonic sense of Keith Jarrett and Bill Evans and is designed to inspire and soothe, even when it swings.” — All Music Guide Biography by Dr. Judith Schlesinger. 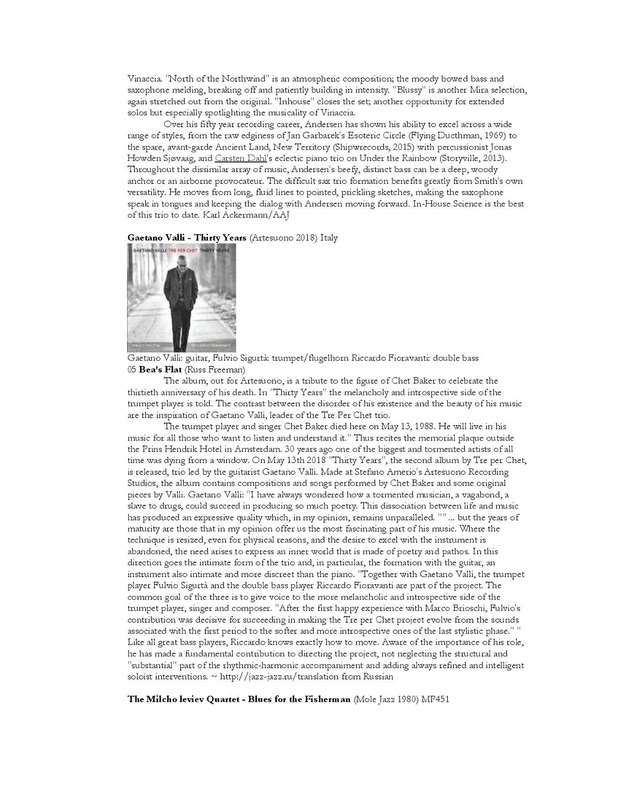 Playlist for Tom Ossana – The Thin Edge – September 12, 2018 MST 7:00 to 9:00p.m.